Unfortunately time constraints (i.e my day job) keep getting in the way of me updating this site so all Ive been able to do so far for the Sunderland page is a very basic bit of background. 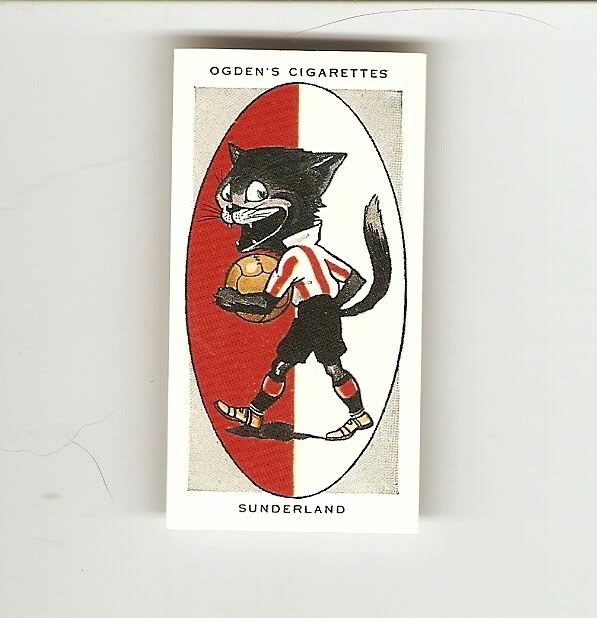 Ive shown below a football cigarette card from the Ogdens AFC Nicknames series that shows a caricature of the most commonly known nickname for Sunderland, The Black Cats. "Sunderland, once famous as the "Team of all the talents", are today less gloriously known as the "Wearsiders", the name being derived from the the river Wear on which Sunderland stands, or the "Rokerites", Roker Park being the name of their ground. They still, however, retain a Black Cat as their mascot. A number of scholl teachers were responsible for launching the club in 1880. As in the case of Newcastle United there has usually been a strong Scottish colony of players at Sunderland and it is very remarkable that although they have had brilliant teams, they have never won the Cup. The League Championship, however, has been gained five times". So there you have it, according to these cards (which were issued in 1958) Sunderland didnt actually win the FA Cup in 1937 !! So obviously we cant take the descriptions on the card too seriously but dont worry I will be coming back to this page to expand on those sketchy details a bit more ! !